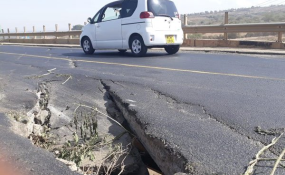 A motorists zooms past the crack at Fai Amario Bridge on the Naivasha-Maai Mahiu highway on March 24, 2019. An engineer at the site has discounted fears that crack is linked to Sunday's earthquake that shook the country. On Sunday, several Kenyan counties, including the capital Nairobi, were rocked by fleeting shaking of the earth. According to the www.earthquaketrack.com, the epicentre of the 4.8 magnitude quake was in Wundanyi in Taita Taveta County. But what is an earth tremor? And how different is it from an earthquake? An earth tremor is an involuntary quivering movement that occurs after the main shock of an earthquake--vibrations caused by rocks breaking under stress against an underground surface refers to as a fault plane. It comes as a vibration at the surface of the earth resulting from underground movement along a fault plane of a volcanic activity. According to Longman dictionary, an earth tremor is a small earthquake in which the ground shakes slightly. Both tremors and quakes are signs of seismic movement within the earth. An earth tremor will however feel like a small sharp jolt followed by a few stronger sharp shakes that pass quickly. An earthquake, on the other hand, will feel like a gentle bump followed several seconds later by a stronger rolling shaking that may feel like a sharp shaking for a little while. Generally, an earth tremor takes only seconds-- typically about 10-30 seconds. Readjustments in the earth may cause more aftershocks that can occur intermittently for weeks or months. The size or magnitude of earthquakes is determined by measuring the amplitude of the seismic waves recorded on a seismograph and the distance of the seismograph from the earthquake. These are put into a formula which converts them to a magnitude, which is a measure of the energy released by the earthquake. For every unit increase in magnitude, there is roughly a 30-fold increase in the energy released. For instance, a magnitude 6.0 earthquake releases approximately 30 times more energy than a magnitude 5.0 earthquake, while a magnitude 7.0 earthquake releases approximately 900 times (30x30) more energy than a magnitude 5.0. A magnitude 8.6 earthquake releases energy equivalent to about 10,000 atomic bombs of the type developed in World War II. Undersea earthquakes can cause a tsunami, or a series of waves which can cross an ocean and cause extensive damage to coastal regions. The destruction from strong earthquake shaking can be worsened by fires caused by downed power lines and ruptured gas mains. Additional report by Harry Misiko and Daily Monitor.